A cluster of newborn stars herald their birth in this interstellar Valentine's Day commemorative picture obtained with NASA's Spitzer Space Telescope. These bright young stars are found in a rosebud-shaped (and rose-colored) nebulosity known as NGC 7129. The star cluster and its associated nebula are located at a distance of 3300 light-years in the constellation Cepheus. A recent census of the cluster reveals the presence of 130 young stars. The stars formed from a massive cloud of gas and dust that contains enough raw materials to create a thousand Sun-like stars. In a process that astronomers still poorly understand, fragments of this molecular cloud became so cold and dense that they collapsed into stars. Most stars in our Milky Way galaxy are thought to form in such clusters. "The diameter of the cluster is equal to the distance between the Sun and the nearest star, Proxima Centauri. Within that distance, we find 130 stars. By combining data from the Smithsonian's MMT Telescope in Arizona with Spitzer data, we find that roughly half of these stars are surrounded by disks of gas and dust. Each of these disks is a forming solar system," said researcher Tom Megeath (Harvard-Smithsonian Center for Astrophysics). As in any nursery, mayhem reigns. Within the astronomically brief period of a million years, the stars have managed to blow a large, irregular bubble in the molecular cloud that once enveloped them like a cocoon. The rosy pink hue is produced by glowing dust grains on the surface of the bubble being heated by the intense light from the embedded young stars. Upon absorbing ultraviolet and visible-light photons produced by the stars, the surrounding dust grains are heated and re-emit the energy at the longer infrared wavelengths observed by Spitzer. The reddish colors trace the distribution of molecular material thought to be rich in hydrocarbons. The cold molecular cloud outside the bubble is mostly invisible in these images. However, three very young stars near the center of the image are sending jets of supersonic gas into the cloud. 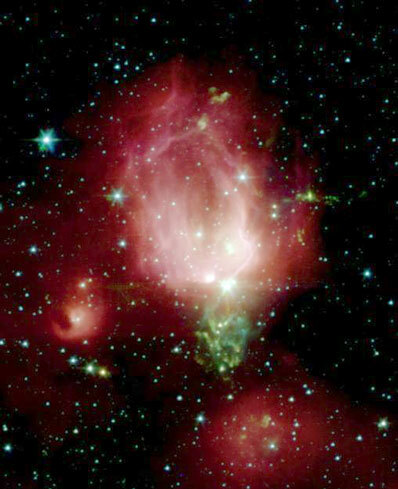 The impact of these jets heats molecules of carbon monoxide in the cloud, producing the intricate green nebulosity that forms the stem of the rosebud. "The formation of our own solar system may have begun in a similar setting. Our Sun's siblings would have drifted away and disappeared into the night sky long ago," said Megeath. Not all stars are formed in clusters. Away from the main nebula and its young cluster are two smaller nebulae, to the left and bottom of the central 'rosebud,' each containing a stellar nursery with only a few young stars. The Spitzer Space Telescope image was obtained with an infrared array camera that is sensitive to invisible infrared light at wavelengths that are about ten times longer than visible light. In this four-color composite, emission at 3.6 microns is depicted in blue, 4.5 microns in green, 5.8 microns in orange, and 8.0 microns in red. The image covers a region that is about one quarter the size of the full moon.